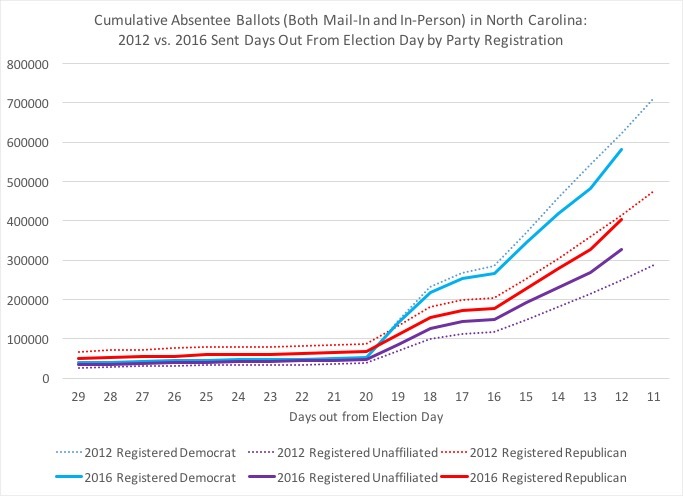 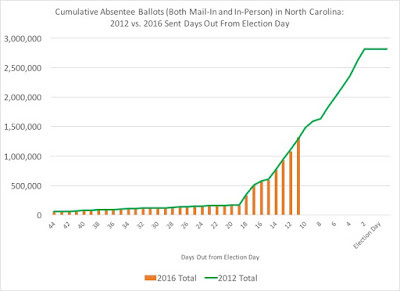 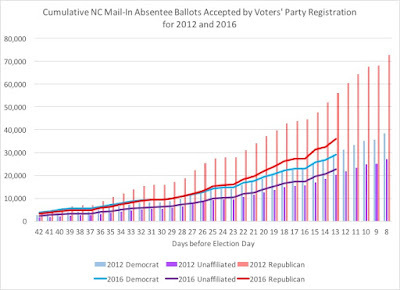 With the expansion of both early voting locations and hours yesterday, North Carolina's absentee ballots (including both mail-in and in-person methods) has moved ahead of the same day totals from four years ago. 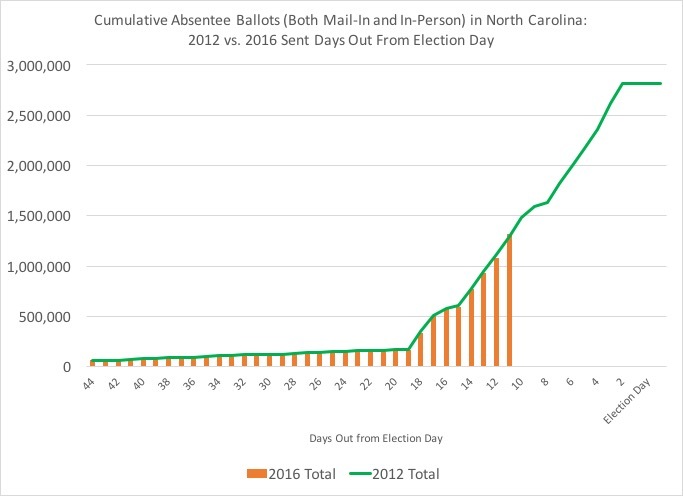 In comparison to 2012's same day total of 1,289,930, this represents an increase of 2 percent for this year's ballot totals over the same day four years ago. 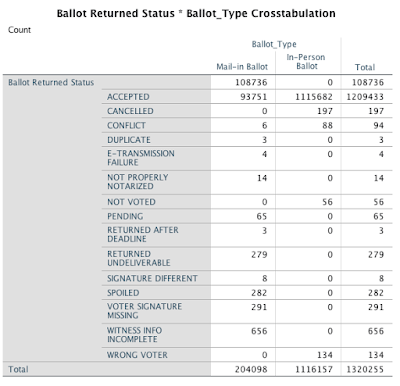 Registered Democrats are 44 percent of the total ballots so far, with registered Republicans at 31 percent and registered unaffiliated voters at 25 percent. 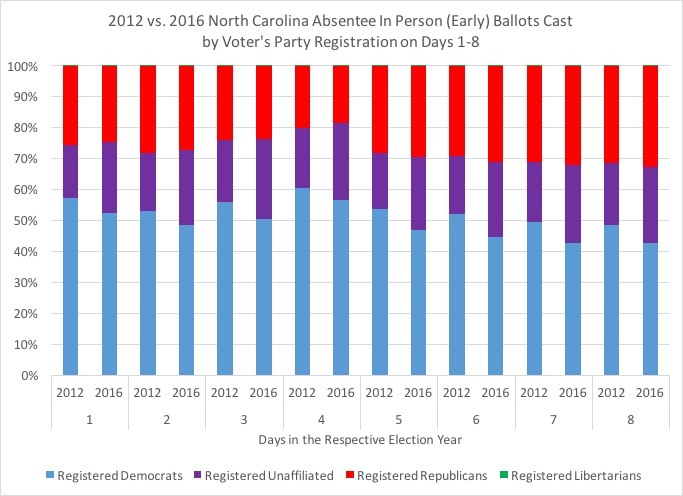 However, both registered partisan groups are below their same-day totals from 2012: registered Democrats are 7 percent behind, while registered Republicans are 2 percent behind. 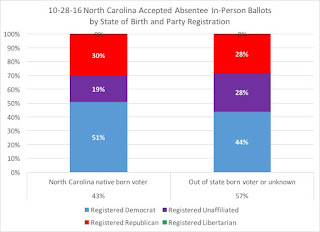 The surprise this year continues to be registered unaffiliated voters, who are running 32 percent ahead of where they were this same day four years ago. 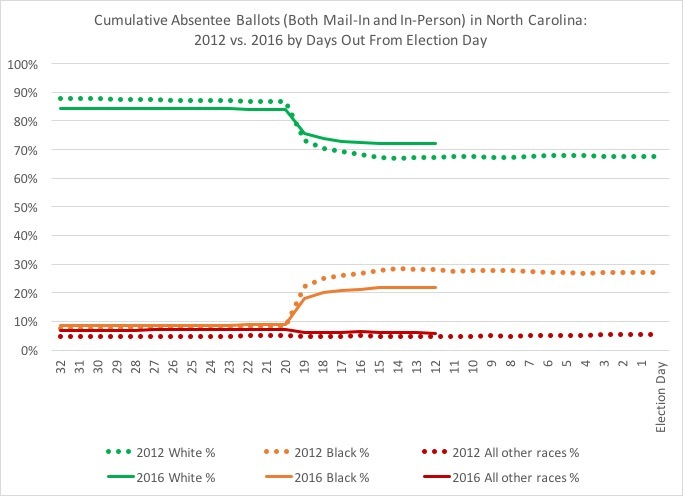 In comparing the performance among voters by race to 2012's same day totals, white voters continue to over-perform their percentages from four years ago, while black voters are under-performing their same-day percentages from 2012. 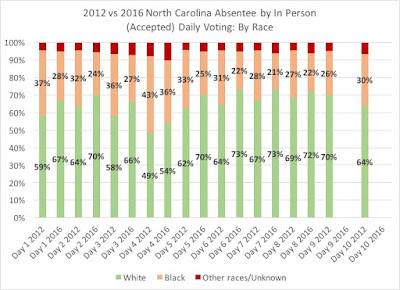 Currently, whites are 72 percent of the total ballots, with blacks at 22 percent and all other races/unknown at 6 percent. 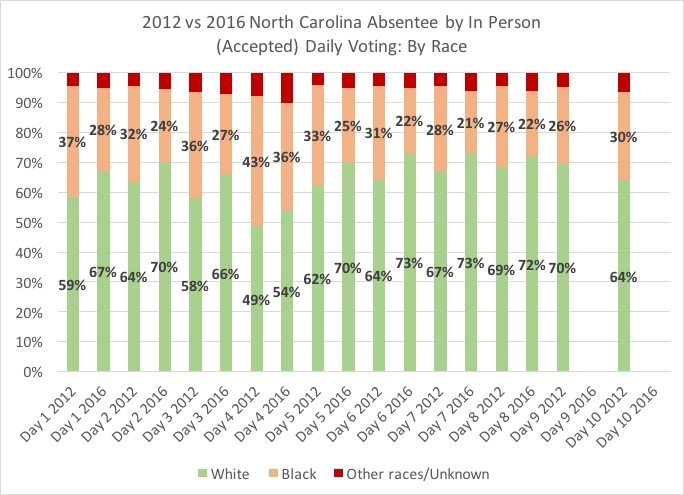 White voters are 10 percent ahead of where they were from four years ago on this same day, while black voters are 20 percent behind and all other races/unknown are 30 percent ahead of where they were four years ago. 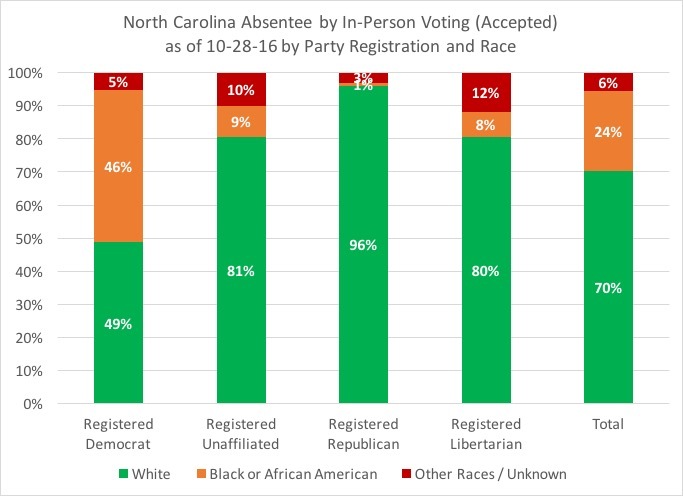 An important day may be this coming Saturday for minority voters in North Carolina; more on that just below. 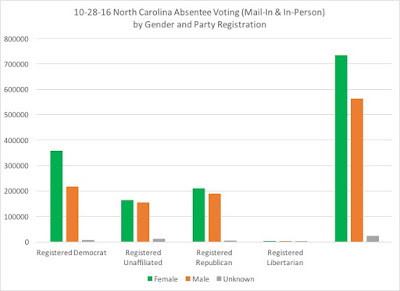 Of female voters, 49 percent are registered Democrats, 29 percent are registered Republicans, and 22 percent are registered unaffiliated. Among male voters, 39 percent are registered Democrats, 34 percent registered Republicans, and 27 percent registered unaffiliated. 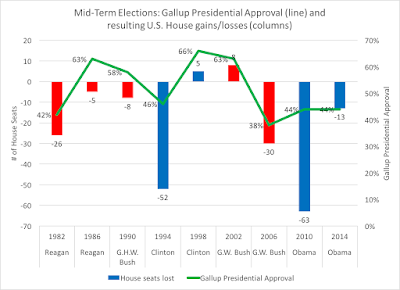 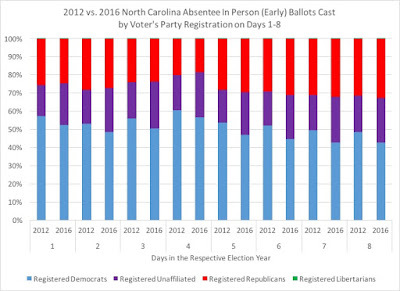 Moving on to the bulk of the ballots, in-person, the party registration break-down and performance compared to 2012's same-day totals show advantages to registered Republicans and unaffiliated voters. Registered Democrats are 47 percent of the accepted in-person ballots, with registered Republicans at 29 percent and registered unaffiliated voters at 24 percent. 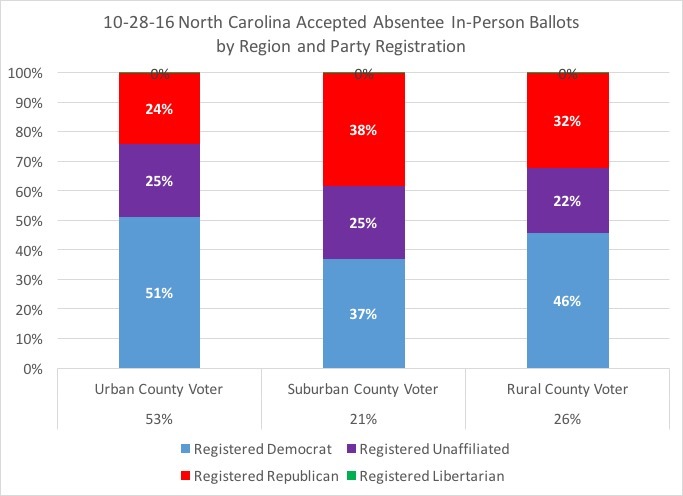 In the first eight days of in-person voting, registered unaffiliated voters are 35 percent ahead of where they were four years on this same day; not surprising since the majority of new voters coming into the voter pool has been overwhelmingly registering as unaffiliated. 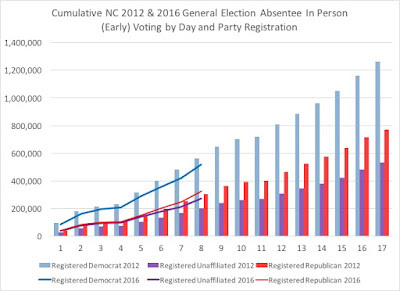 Registered Republicans are 7 percent ahead of their same-day totals for in-person voting, while registered Democrats are 8 percent behind their numbers from four years ago. 2016's daily percentages of accepted in-person voting, compared against 2012's same-day percentages, demonstrate the lack of black voting participation so far. 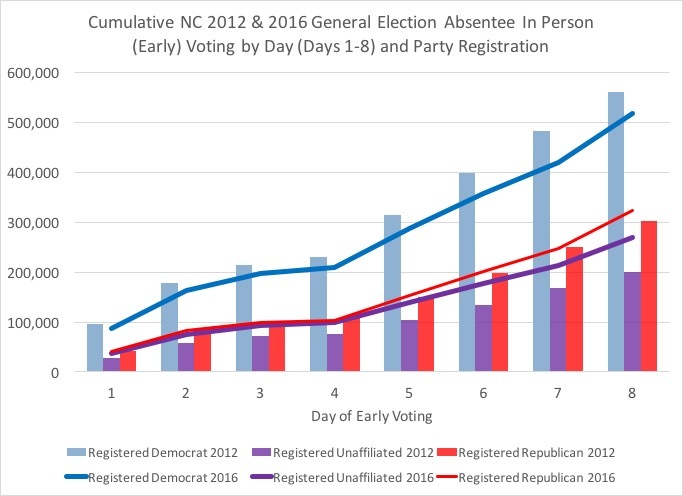 This could be attributable to the reductions in key counties, like Guilford, of the first week of early voting to one location and limited hours. 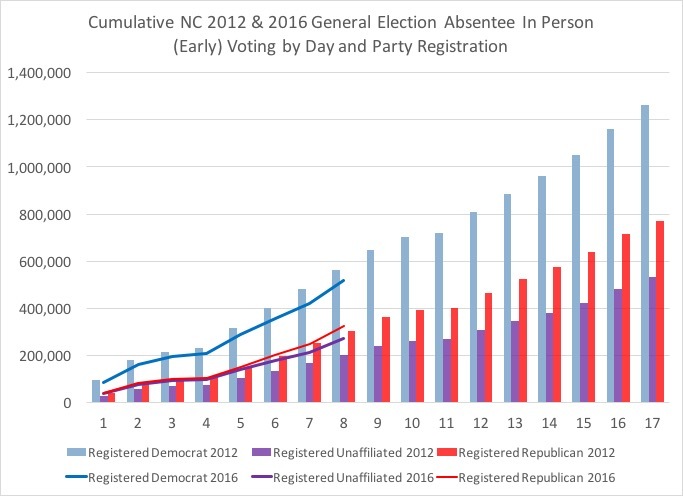 The other aspect that this could speak to is a lack of enthusiasm for the Democratic presidential candidate, something that the Clinton campaign is trying to address in visits like yesterday's to Winston-Salem with Michelle Obama. This Saturday's numbers should show a significant boast if the black percentage is to return to nearer its 2012 numbers. 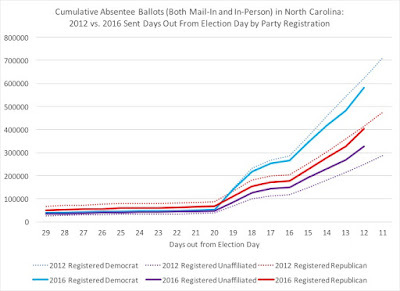 The number of voters who used absentee in-person voting from four years ago has been slightly dropping over the past week, while new voters (since 2012) has been increasing. 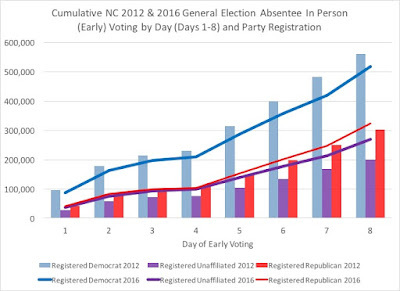 With the expansion of early voting locations and hours, urban counties have bounced back up from yesterday's percentage of 51 to 53 percent of the in-person ballots. 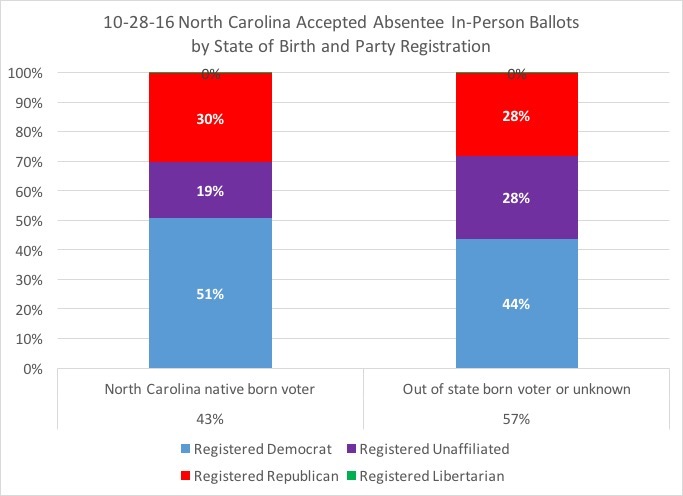 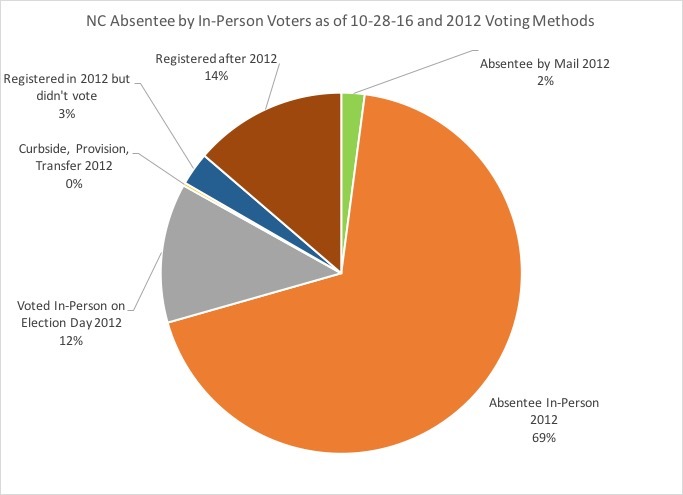 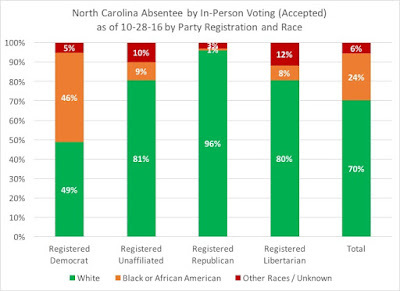 Those voters born out of North Carolina are still dominating the in-person absentee pool. 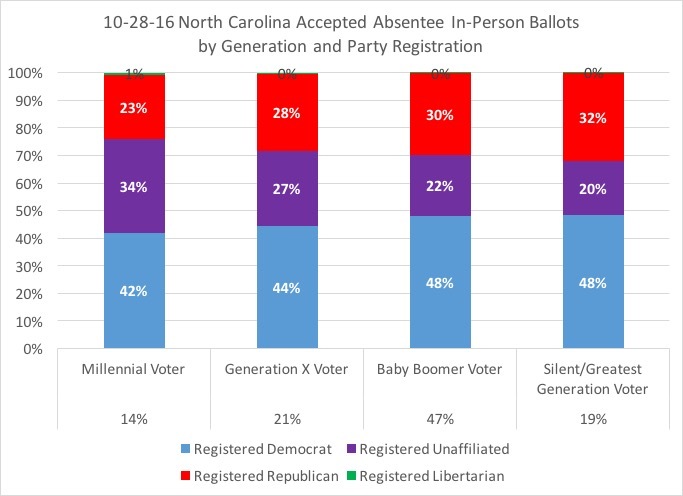 And Millennials have increased from 13 percent yesterday to 14 percent today, indicating a slight increase in younger voters casting in-person ballots. 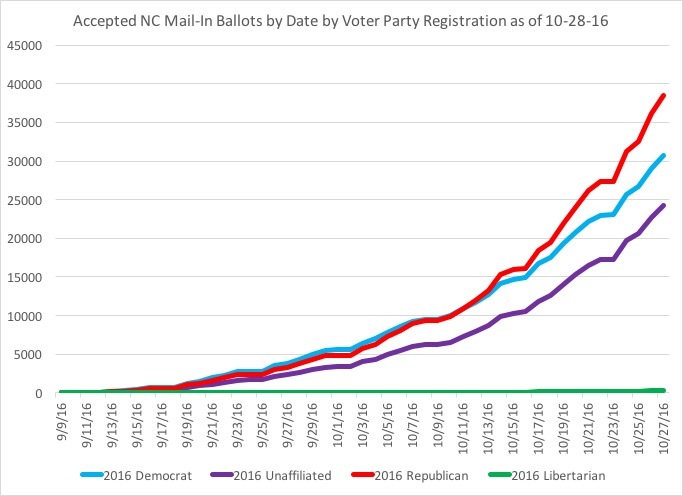 Finally, the mail-in ballots are continuing to show the same patterns as the past few days. Registered Republicans are 40 percent of the total mail-in ballots, with registered Democrats at 31 percent and registered unaffiliated voters at 29 percent. 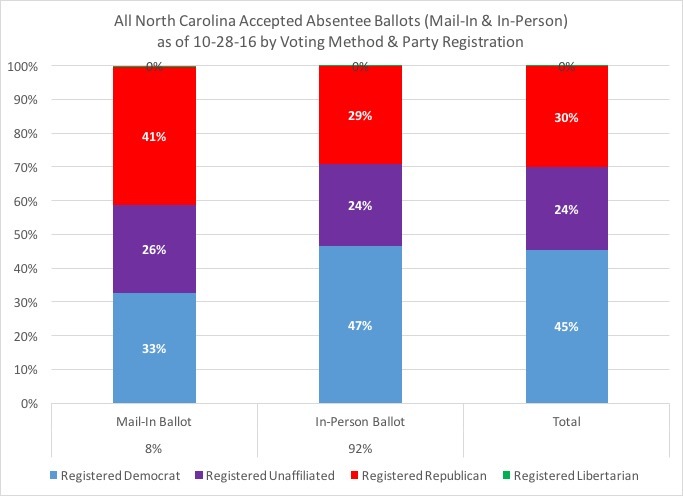 Among the accepted mail-in ballots, Republicans are 41 percent, Democrats 33 percent, and unaffiliated at 26 percent. 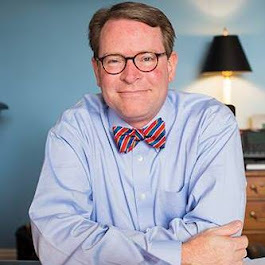 The accepted rates are 48 percent for Democrats, 47 percent for Republicans, 42 percent for unaffiliated, and 46 percent overall. 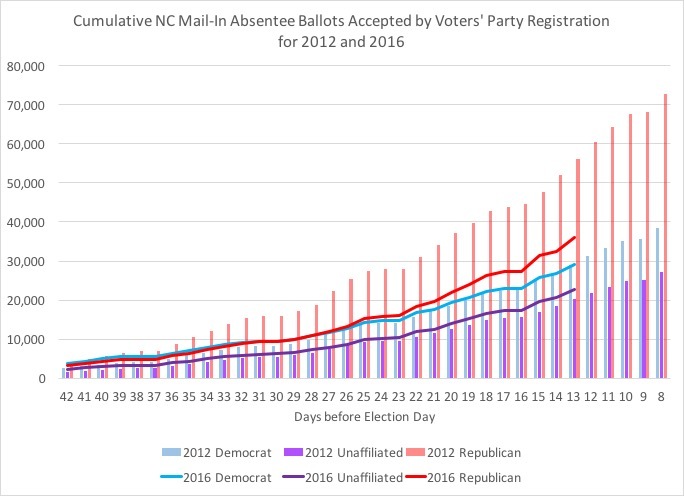 Overall, this year's returned and accepted mail-in ballots are 82 percent of where the numbers stood four years ago this same day, with registered Republicans at 64 percent of their same-day numbers, registered Democrats at 98 percent, and registered unaffiliated voters at 111 percent.